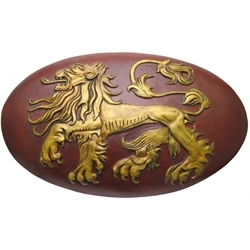 This Lannister Shield From A Game of Thrones comes from the wealthiest family in Westeros. The Lannisters of Casterly Rock ruled as kings in their realm until the Targaryen dragons conquered the continent. Cersei Lannister’s marriage to King Robert Baratheon brought the family to King’s Landing and her son Joffrey’s ascendance to the Iron Throne solidified their power. This adult collectible is officially licensed from HBO's hit series "Game of Thrones” and is a limited edition of 1000 pieces. Each shield is individually serialized and will come with a certificate of authenticity. It also includes a wall mount with slots that will accept most swords to allow you to display up to three of your favorite swords behind the shield. The Game of Thrones Collection is a series of collectible weapons and armor painstakingly recreated from the actual props used on HBO’s hit fantasy epic “Game of Thrones.” The officially licensed collectibles are made from the highest quality materials and have been crafted with special attention to reproduce the authentic details found on the props. This item is not a toy, please keep out of the reach of children. This replica shield is intended solely for display purposes as a collector's item Official HBO Licensed Product 2015 Home Box Office, Inc. All Rights Reserved. Game of Thrones is a trademark of Home Box Office, Inc.
Shield: Fiberglass & resin, embossed & painted with Lannister sigil.